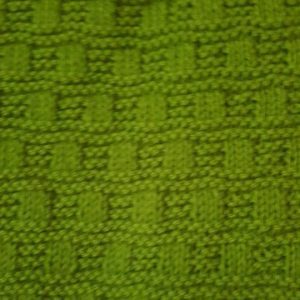 Squares for Wraps are to measure 25cm x 25cm (10 inches x 10 inches). 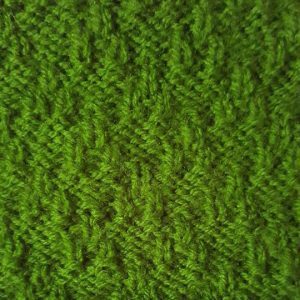 To knit a 25cm x 25cm square use No.8 (4mm) needles with 8 ply yarn, cast on 50-55 stitches, and knit each row plain (ie garter stitch). Test your tension to measure 10 inches. 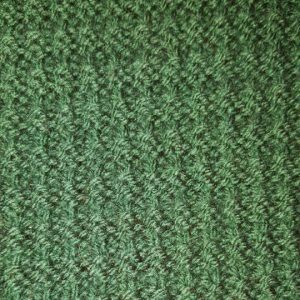 Do not knit one row plain, one row purl (ie stocking stitch) as your square will curl up. 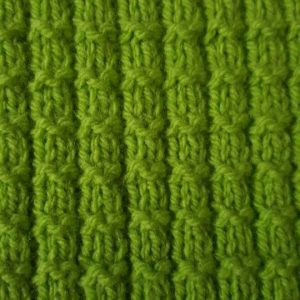 Start each ball of yarn at the beginning of a row and sew in ends. 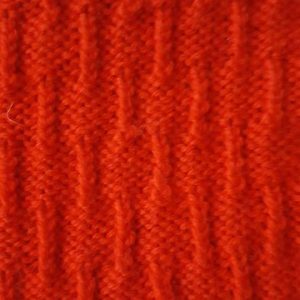 Do not cut ends off short as your square will unravel. 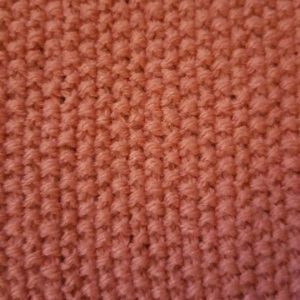 When starting or finishing a square, sew in all ends. 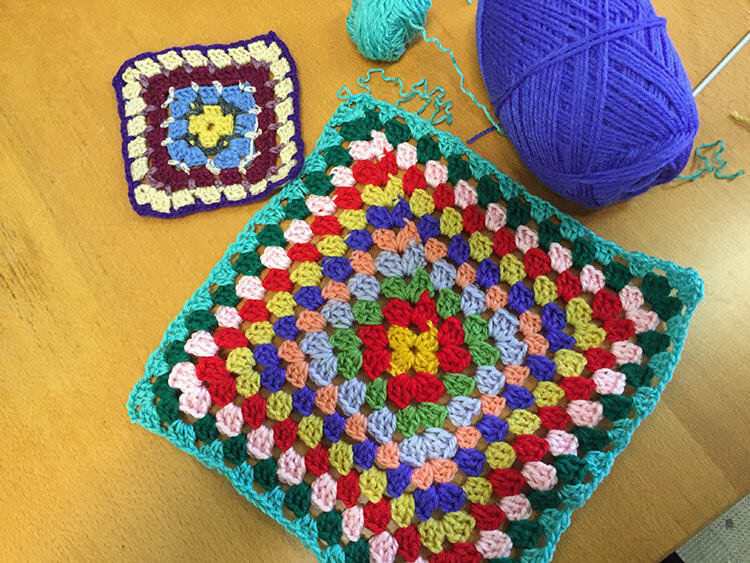 Crochet squares to measure 25cm x 25 cm as for knitted squares – any pattern will do. Some people crochet the whole Wrap in one piece. 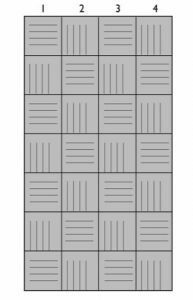 They are made up of 28 squares as per diagram. 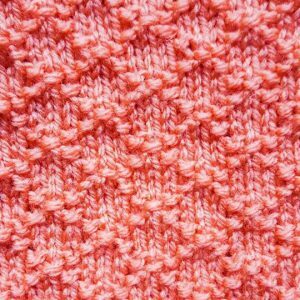 Across: 4 squares = 100cm (40 inches). Down: 7 squares = 175 cm (70 inches). 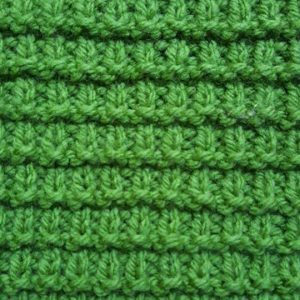 Please keep joins on the same side and flat and alternate the squares vertically and then horizontally.The squares can also be joined using a crochet stitch and finished with a crochet edge. (Optional). 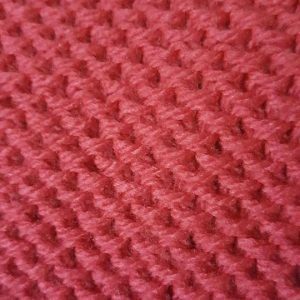 Wraps can be knitted, woven or patchwork lined to finish at approximately 100 cm x 175 cm (40 inches x 70inches). 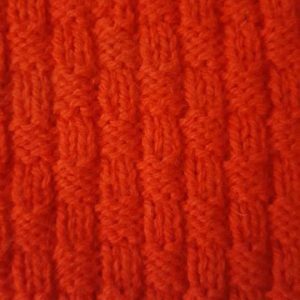 Row 1: K1, increase 1 in next stitch, knit to end of row. 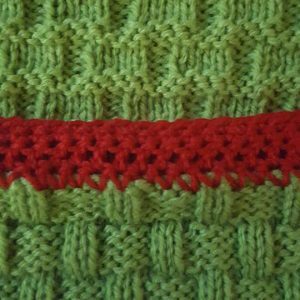 Repeat Row 1 until side edge measures 10 inches (25 cm). 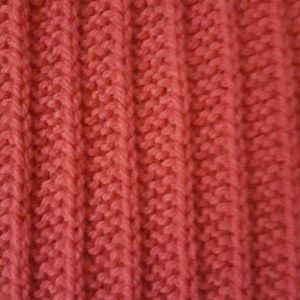 Next Row: K1, K2 together, knit to end of row. 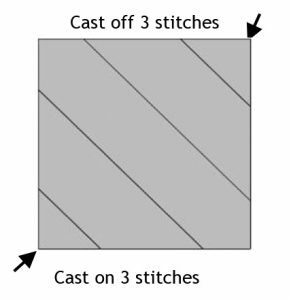 Repeat this row until 3 stitches remain, cast off. 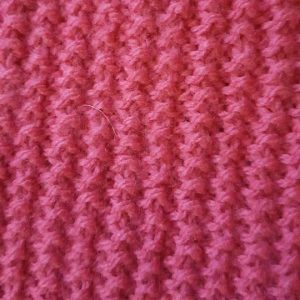 In some instances you may have to decrease 2 stitches per row (beginning and end) towards the last 3 inches of the square due to the tension of various yarns. This will ensure a perfect 25cm square. Try it. It’s easier than it looks. 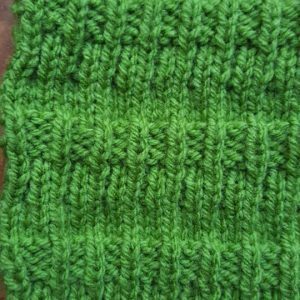 It cuts down on ‘sewing up’ time as 4 or 7 squares can be knitted in one strip. Row 1: k48, k2 tog. Using a contrasting colour tie a marker around the needle. 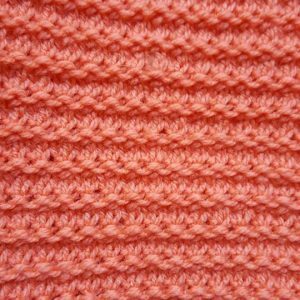 Knit to the end of row. 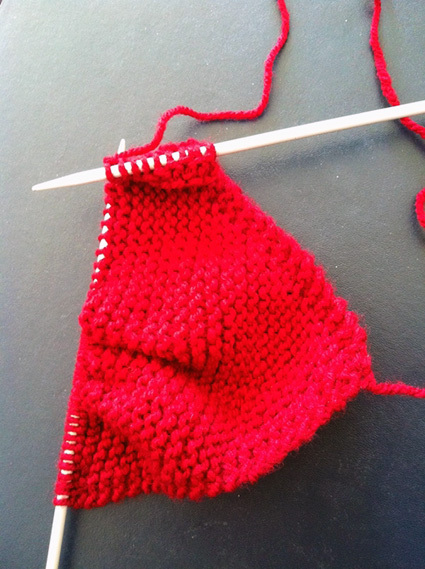 Row 2: Knit to 2 stitches BEFORE the marker, k2 tog. 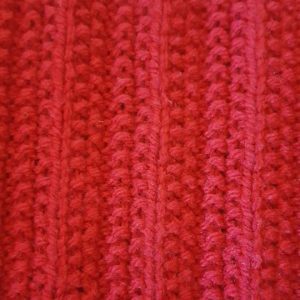 Slip marker, knit to end of row. Repeat row 2 until there are 4 sts left, dropping the marker on the last row. Next row: k1, k2 tog, k1 Next row: k1, k2 together. Final row: k2 together, do not break off thread. 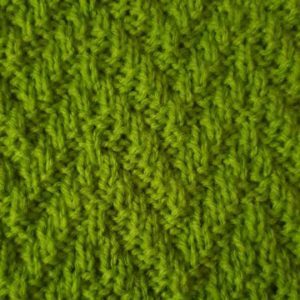 To begin Block 2, pick up 50 stitches along the top edge of Block 1. 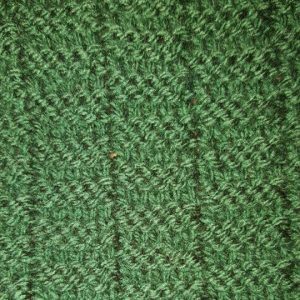 Turn knitting around and then continue by casting on (using the two needle cast-on method) a further 50 stitches (100 stitches). Repeat rows as for Block 1. 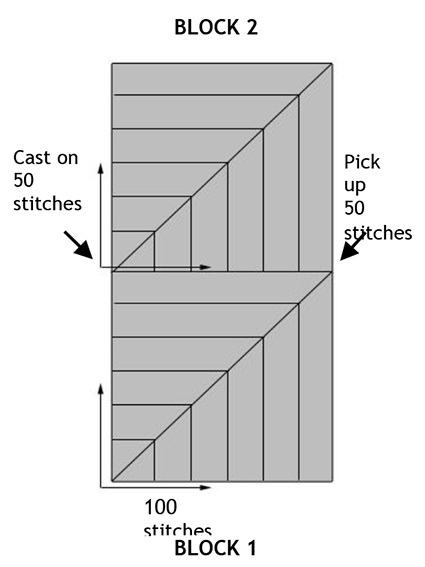 Make columns of 4 or 7 blocks and sew columns together. 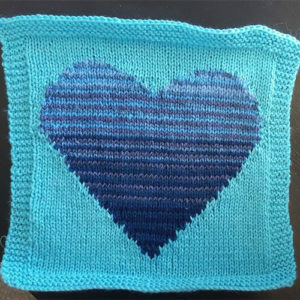 1st block cast on 50 stitches and then pick up 50 stitches along the right edge of the first square of the first column. 2nd block: pick up 50 stitches along the top edge of the square just completed and 50 stitches from the side of the 2nd square in the first column. Continue with this process until all 28 squares have been completed. Please be sure to sew in all loose ends. 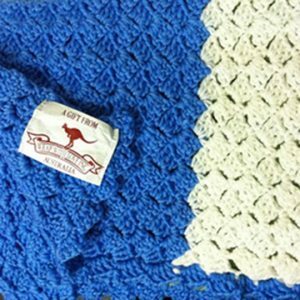 A ‘Gift from Wrap with Love Australia’ label has been printed and we ask that you attach one label to one underside corner of each Wrap. Please email us or phone us on 02 8399 3000 for labels or ask your Area Contact. In an attempt to save money on postage, we have been trialling sewing a label onto one square in each of the bags of squares that we send out for sewing up. And we have always sewn labels on at the warehouse, so feel free to send yours in without a label. 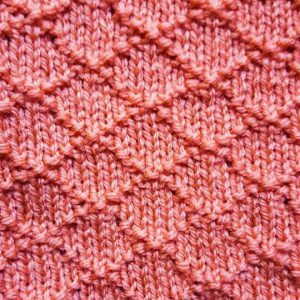 Here are two featured patterns for knitted squares you can use in your wraps. 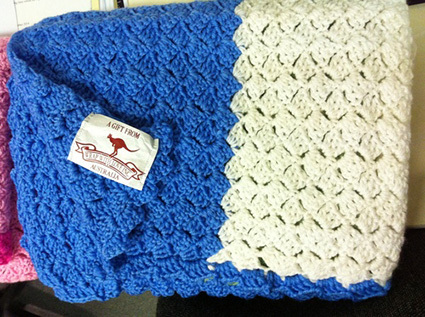 In memory of Jayne Goodes we created a heart pattern you can include in a wrap. 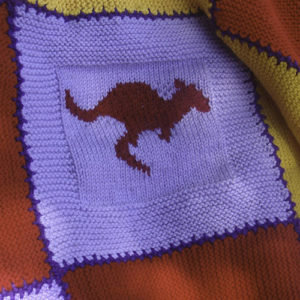 Knitters are invited to include one Kangaroo Square in each Wrap as a way of making our wraps uniquely Australian. 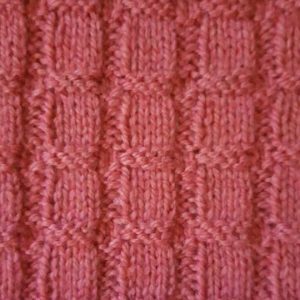 Please download the PDF below for the detailed knitting pattern. 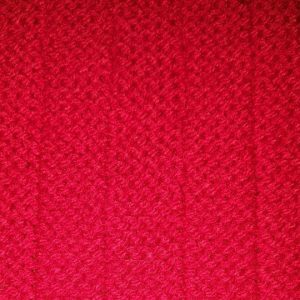 Here are some knitting pattern ideas as alternatives to garter stitch squares. Please check your tension so that your squares measure 25cm x 25cm. Have fun! 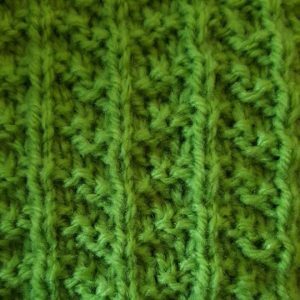 NB: the “wrong side” of this stitch is also good! 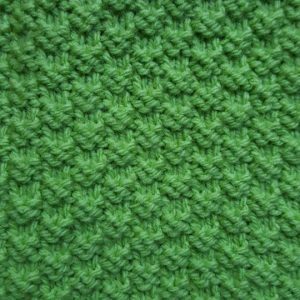 The variety of crochet patterns seems to be endless! 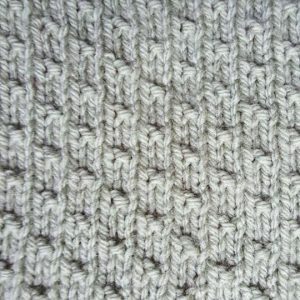 One method(see the blue and white photo below) is called “Corner Start Stitch” or “Diagonal Crochet Stitch”. 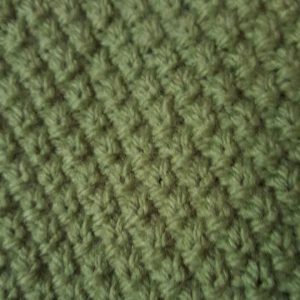 Here are some Crochet pattern ideas. Please check your tension so that your squares measure 25cm x 25cm. Have fun! To start: 6 Ch in light colour, join into a ring with a sl st. Round 1 : light; 2 ch, 2 tr 3 ch, * 3 tr, 3 ch into ring, repeat from * twice, sl st to first 2 ch. Round 2 : Dark; sl st to first sp (2 ch, 2 tr, 3 ch, 3 tr) into first 3 ch sp,* (1 ch, 3 tr, 3 ch, 3 tr) into next 3 ch sp, repeat from * twice, join with a sl st. Round 3 : Light; sl st to first sp (2 ch, 2 tr, 3 ch, 3 tr) into first 3 ch sp,* 1 ch, 3 tr into 1 ch sp (1 ch, 3 tr, 3 ch,3 tr) into each corner, repeat from * ending 1 ch, sl st to join. Round 4 : Dark; sl st to first sp (2 ch, 2 tr, 3 ch, 3 tr) into first 3 ch sp,* 1 ch, 3 tr into each 1 ch sp (1 ch, 3 tr, 3 ch, 3 tr) into each corner, repeat from * , ending 1 ch, sl st to join. 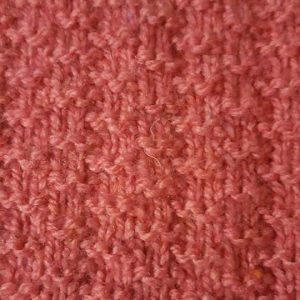 Continue until square measures 10 inch square or 25 cm square..
Fasten off, leave a thread long enough to join squares with a tapestry needle when making up.